It has often been said that says good things come to those who wait. This is my mantra every time I make this recipe for Homemade Almond Butter. Patience is definitely the secret ingredient in this recipe. It takes about fifteen minutes for the almonds to be processed. The almonds begin their transformation from coarsely chopped to finely chopped, and then, there is a clump that forms. Be patient. When properly processed, the oils in the almonds will magically be released and before you know it, you have homemade almond butter. Continue to process until you reach the texture you desire. At this stage, you can add honey and/or a pinch of salt. I prefer my homemade almond butter au naturel. Remember to begin the whole process with roasted almonds that are at room temperature. 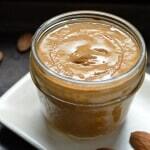 If you follow this link, you will find a few videos that demonstrate the different stages of this homemade almond butter process. As you can see from my list of ingredients, I do not add any oil. That’s my personal preference. If desired, go ahead and experiment. Oh, I almost forgot to mention, this is a great week-end project to do with the kids. Have fun! With a little bit of patience and a food processor, you will be rewarded with creamy homemade almond butter. Easy, economical and natural. Place room temperature roasted almonds in the food processor. Process on medium-high speed for 15 minutes. Scrape the sides of the bowl every couple of minutes. Transfer to jar, refrigerate and enjoy! To roast almonds: Place almonds in a single layer on a baking sheet in a preheated oven at 300℉ for about 20 minutes. Move almonds around a few times while they are roasting. Cool to room temperature before you start the process of making homemade almond butter. how much is one serving? one tablespoon or more?